Compact low-mass water heater with 87% AFUE efficiency saves customers as much or more than the leading cast iron boilers, AT HALF THE SIZE! Economical: Some consumers have experienced fuel savings of up to 50%! No costly storage of hot water when it is not needed…Cold start capabilities! Direct vent or chimney vent! The Toyotomi/Oil Miser water heaters are on-demand, which means there is no costly storage of hot water until it is needed. Like all Toyotomi products they are safe, reliable, and easy to install. You’ll love the convenience…and you’ll love your new lifestyle. 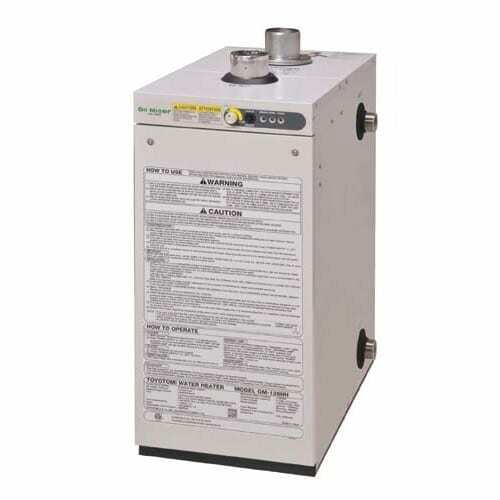 Ask your local dealer about Toyotomi/Oil Miser water heaters, today. Capacity of Heat Exchanger 5.10 gal. (1) Check state andlocal codes/ordinances for permitted use. Can also supply domestic hot water provided it is used with indirect storage tank. (2) External tank to be purchased from local suppliers.